I have setup two inventories, for example one inventory/warehouse A... is available to Spain and Germany...and I would like the second inventory/warehouse B.... to be available to ALL remaining countries. Is there a way to do this or do I have to add each country one-by-one to every "warehouse B" inventory for every variation and every product? This is very easy as you only need to setup zones. You set zone restrictions and add relevant zone to inventories. Thank you for the reply. I actually don't want it based on "zones"....I don't want customers seeing any other stock or prices other than what is restricted to their country, for example only Spain and Germany customers (GeoIP based) will see the stock and prices available for them. In some cases those prices may be higher than the Rest of World prices. Therefore I think the only way is to restrict based on countries using the WP GeoIP native plugin. I had set it up and it was working...I had set up say "Inventory 1" with Spain and Germany as Regions....but the issue is that for all customers not in those Regions, unless you setup up "Inventory 2" it will always show Out of Stock with a 0.00 price. My question is when you set up "inventory 2" for the same product....as far as I can see, you have to manually add each and every country...there is no "Rest of World" option...or some sort of bulk adding of countries in the Region option. Hope it is some what clear to what the issue I am facing. PS. I just tested again and now the Pricing per inventory is not working at all. Pls, open a private ticket so we can start helping you out. I would also like this kind of setup. Can you share the solution? Feel free to describe your scenario here. Please, do read the MI documentation, it will answer a lot of questions. MI uses zones created in WC and no other. Popup is one of the options not a must use. GoeIP on its own - we do not thing best option as it only sees buyers location and not desired shipping destination. We think MI is built considering all situations and with the best UX in mind. The conditions for inventory should be expanded, so we only have to list exceptions, not add a list of countries. The Shipping Zones we already maintain in WooCommerce do exactly this and should be used more. I think the answer is, the "Zones" option should be able to be used with the GeoIP location function of WooCommerce, and not require a pop-up. Which is not good for mobile / SEO. This means we limit inventory by WooCommerce shipping zone, and we determine the customer's zone from the built-in GeoIP function. This solution should include the "Locations not covered by your other zones" default functionality. I have read through the documentation and searched keywords. Not sure if its a language thing, but its pretty confusing. If you don't want to add huge lists of countries to products one by one, the Zones feature is ideal. 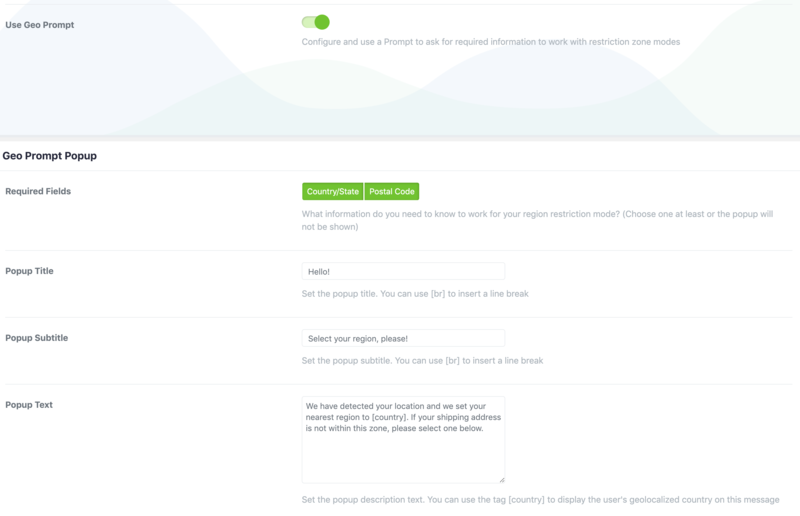 But it should set the zone by Geo IP and then allow the customer to refine it, the same as they would have to with the 'countries' option anyway. Why don't you turn the popup off and only use the sidebar widget?